Susanne Jaschko / research / contributions to other research projects / 25sec. publications academic teaching lectures + presentations + moderations workshops contributions to other research projects 25sec. Culture-Gates Berliner Gazette Harald Szeemann - and now? 25sec. 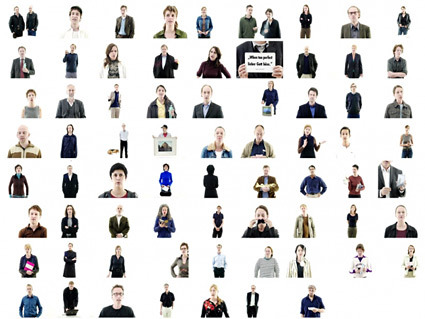 is a dynamic videoportrait consisting of 74 single portraits, and puts a flash light onto individual positions from institutional and independent art contexts in Berlin. In the videoportrait art- and culture mediators are giving a 25sec. statement, which outlines their goal within their work. In addition they could support their statement by an object with the intention, to make a link to their discourse and context. Within the 25sec. show at "guestroom" the videoportraits are presented alternating on two monitors. Each single portrait and statement is formatted in 25sec. slots. The monitor switch underlines the shift from one position to the other, even extends it into the gallery space.